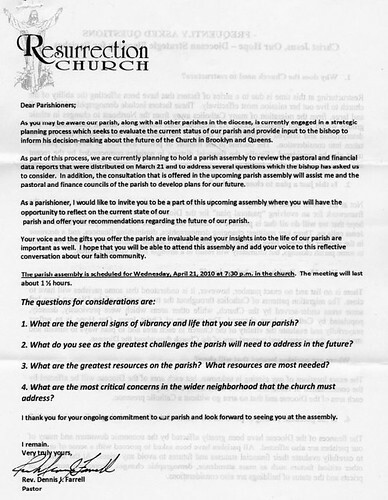 No new news as of now with the brooklyn church reorganization. This is all news we already knew but it is a good reminder that Resurrection Church and every church is on the table. Basically the church may have to close some locations due to lack of attendance and some financial woes. Bob Rossi, a long-time pillar of Resurrection Church and the Knights of Columbus passed away on May 1st as a result of an apparent heart attack. Help Brooklyn Blue Feather with Book and Candy Drive! Registration 2009-2010 for Religious Education will be held in the Religious Education Office Community Center in the Resurrection Church Rectory Basement.